We get questions all the time about how to prevent aging, slow it down or take away those pesky lines and wrinkles. We have the answer – NuFACE Trinity Facial Toning Device! Chosen by over 5,000 beauty industry experts as the 2013 Beauty Insiders’ Choice Award for Best Skincare Tool, this product is truly worth the investment, especially if you’re considering more invasive procedures or botox. 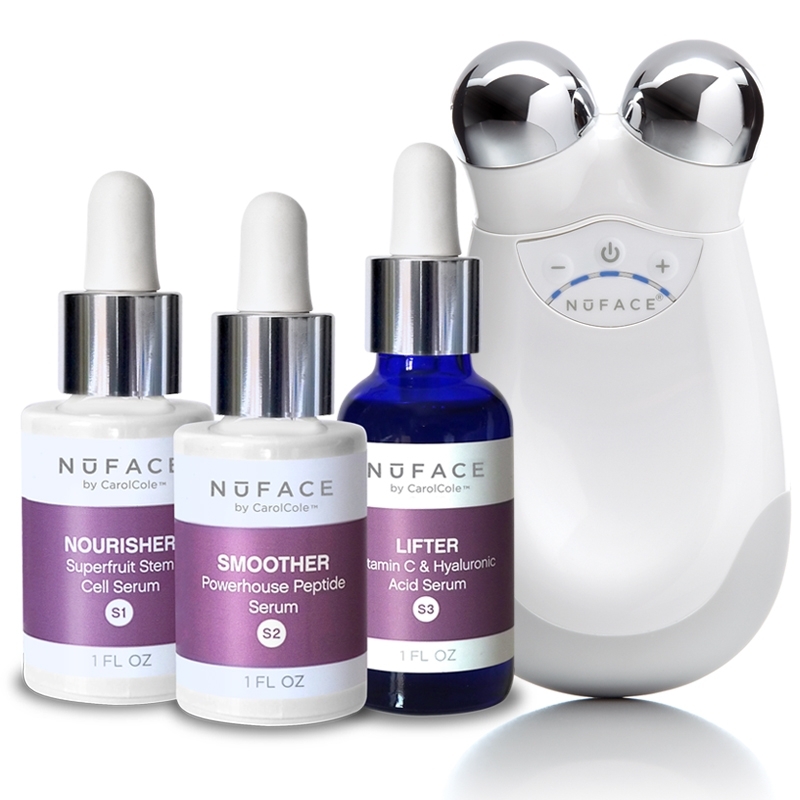 The NuFACE Trinity will firm AND plump skin, so say goodbye to loose jowls, fine lines and wrinkles. It will also restore your youthful glow, decrease puffiness, reduce dark circles, shrink enlarged pores and reduce scarring. (What can’t it do?!) And with treatments in the privacy of your own home, it can be your little secret! Most users see a difference in their skin after one use. It is recommended to use your Trinity at least 5 days a week for the first 90 days, then 2-3 days a week to maintain results. I know that may sound like a lot of work, but it’s really only 5-20 minutes a day, so take this time to pamper yourself and consider it your “me” time. Clients are also curious about the Trinity Attachments. The Trinity Facial Trainer works from the inside out with microcurrent technology to gently and effectively stimulate skin. Whereas the Trinity Wrinkle Remover works from the outside in, utilizing red and infrared light of different wavelengths to address different depths of wrinkles within the skin. As these lights are absorbed, your skin increases its production of collagen and elastin, improving firmness and texture. When you purchase a NuFACE Trinity (in White or Petal Pink), you will be entered into a contest to win a pack of 3 full size NuFACE Serums, including: Nourisher – to repair and protect skin, Smoother – to decrease wrinkles, and Lifter – to tone skin and reduce discoloration. This prize pack is a $256 Value – WOW! That’s not all. When you purchase any NuFACE device, you can also get a FREE NuFACE Crème Primer! Just apply code NUCREME in your shopping cart at checkout. Have any questions about NuFACE? Let us know! This is an amazing giveaway and I REALLY want one of these! Completely agree with Annette....Miracle Wand would have been a more appropriate name! Thanks for sharing! Thank you for following us Annette! Awesome giveaway and this sounds like great stuff. Doesn't this sound incredible? We're so excited to be able to offer our clients this giveaway too! Thank you for following our blog, have a beautiful day! One of the primary signs of aging occurs at the region underneath the eyes. The skin in that area is very thin, sensitive, and delicate. Fine lines appear as you grow older. It needs proper care and moisturising . In fact improving the levels of elastin and collagen in your skin is the very best way to reduce wrinkles however even those skin care products advertised as the best wrinkle reducers do not necessarily achieve this.